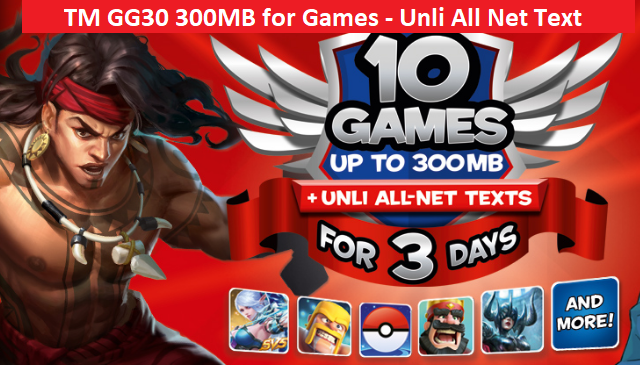 Here we go again guys TM Promos offer GG30 come with 300MB Data good for games and enjoy Unlimited Text to all network.Good thing with this you can spend your 300 MB Data for games and well already discussed to my previous article TM GG30 Unli All Net Texts with COC and Mobile Legends but the difference with this post GG30 updated new promo mechanics you can now play your favorite games like Pokemon GO,Mobile Legends,Clash Royale,Clash of Clans,Vain Glory,marvel Future Fight,Summoner War,Legacy Discord,Candy Crush Saga and Candy Crush Soda Saga. Yes thats right you can now play on your favorite top 10 games. How to avail TM GG30 Promo? Thanks for reading, if this article is useful to you let spread and share to others.Feel free to leave you feedback below.